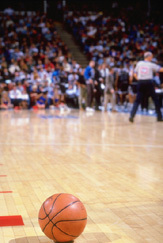 With all its running, twisting, turning, and jumping, basketball is one of the hardest games on feet. Different movements put all the areas of the foot at risk. That is why proper conditioning, stretching, and well-fitted shoes are critical to a healthy enjoyment of the sport. Ankle sprain is a particularly common injury in basketball. But the repeated shock and pressures on the foot can also lead to inflammations, including Achilles tendonitis, plantar fasciitis, and sesamoiditis. A wide toe box with plenty of room for your toes to move around. Not enough room can lead to blisters, corns, and calluses. Lightweight, breathable material for uppers; generally, leather is recommended. Dense, abrasion-resistant soles that are low to the ground for better traction and support. A well-cushioned midsole for a shock-absorbing layer. An EVA or EVA-compressed layer is lightweight but not as durable or stable. A polyurethane layer has greater stability, but it is often heavier, too. Bend in the forefoot of the shoe, which is at the ball of the foot near the toes. Be sure there is less bend in the arch where you need the added support to keep the foot stable. A firm heel counter that fits snugly. Laces as the form of closure give you the ability to adjust for the support you need throughout the foot. When buying basketball shoes, be sure to take the socks you plan to wear with them to ensure a proper fit. Have your feet measured standing up and fit the shoes to your larger foot. Walk around, turn, twist, and jump in each pair on a hard surface to see how your foot feels during each of these movements. Most importantly, make your choice based on comfort.